In large bowl, make cake mix as directed on box. Stir in the 12 finely crushed cookies; pour into pan. Bake 20 to 25 minutes or until toothpick inserted in center comes out clean. Cool completely, about 1 hour. In medium bowl, stir frosting and whipped topping until incorporated. Frost cooled cake; top with the 16 chopped cookies. To serve, cut into 6 rows by 4 rows. Store covered in refrigerator. Make it easy! To finely crush Oreo™ cookies, place in large resealable food-storage plastic bag, and use rolling pin to crush. Scrape insides of bag with spatula to get all of the filling and cookies. Switch it up! Oreo™ cookies come in many varieties and flavors. 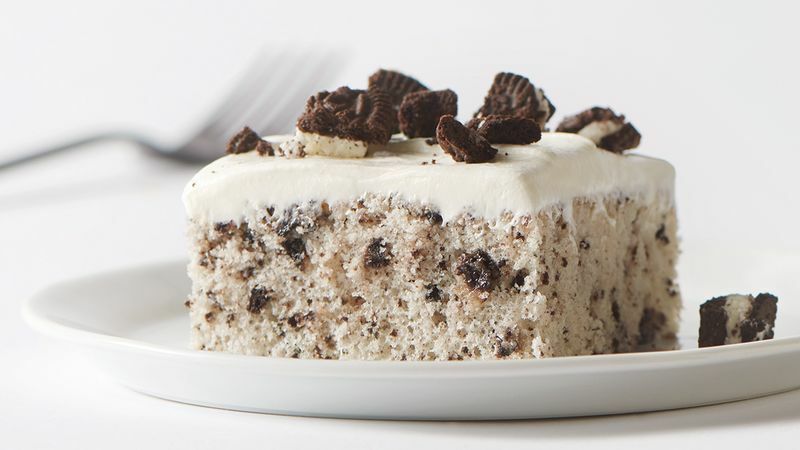 Use your favorite in this cake for your own unique Oreo™ cookie combination.